For dreamy days spent swimming in sparkling crystalline waters and lazing on sugar-white sand beaches beneath gently swaying palms, the Caribbean has it covered. We check out the top 10 family hotels in the Caribbean for fabulously fun-filled family vacations, all promising outstanding activities for kids and parents. What: Spectacularly set on three pristine white sand beaches at Montego Bay, this all-inclusive resort offers an awe-inspiring combination of activities, amenities and attractions. There are 430 newly-refurbished guestrooms tempting with chic Caribbean décor as well as three freshwater swimming pools, a giant Jacuzzi, six sleek bars and four gourmet restaurants serving international and local delicacies. 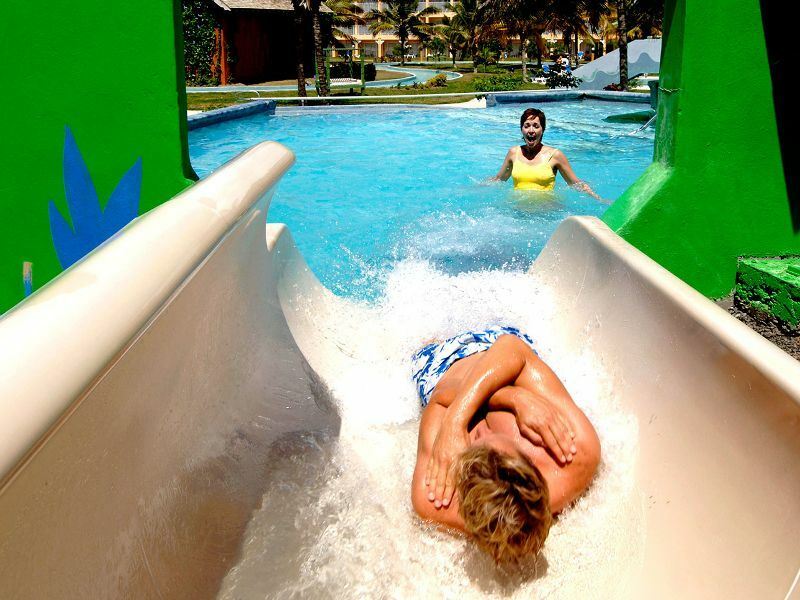 Best for kids: The adrenalin-pumping Pirates Paradise Waterpark thrills with two 35-foot high waterslides, a Caribbean pirate ship, two elevated whirlpools, the Blackbeard's Lazy River and the Pirate's Plank Bridge. There are two kids’ clubs; Club Mongoose caters for children aged two to 12 years whilst the Pirates’ Cove Teen center keeps 13-19-year-olds amused with pool tables, arcade games and discos. Best for parents: Book an indulgent signature seaside massage treatment in the spa, work out at the fitness center, enjoy premium-branded cocktails in six bars, and organise a babysitter for late-night partying at the Tamarind Lounge. 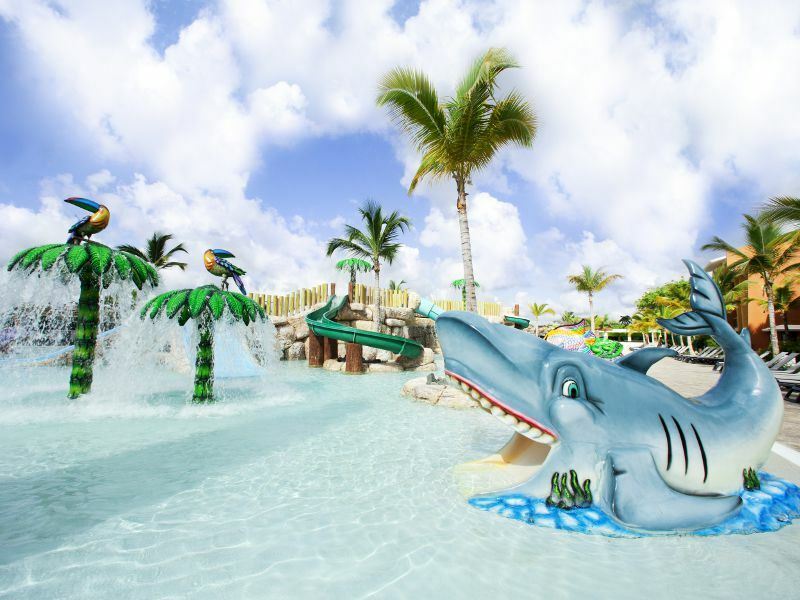 There are four championship floodlit tennis courts, basketball, mini-golf, non-motorized watersports (paddleboats, sunfish sailboats, snorkeling and kayaking) and nightly live entertainment including fashion shows, BBQ’s and themed parties. Scuba diving, glass-bottom boat rides and parasailing are also available at an extra charge. More information and to book: Sunset Beach Resort and Waterpark. 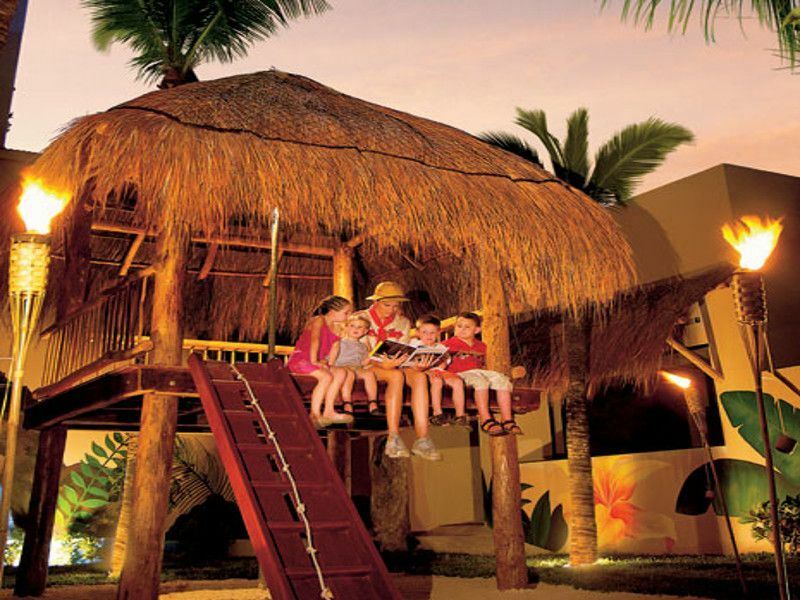 What: Located on the beachfront at Punta Cana, this stylish five-star playground is geared up for family fun with a four swimming pools, 11 specialty restaurants, a 24-hour casino and a huge Las Vegas-style theater with a bar on each level. Each of the 1,990 rooms and suites are furnished with rich woods and décor that mixes designer-inspired white interiors with dramatic splashes of colour. Best for parents: Indulge at the luxurious U-Spa Bávaro, work out with cardiovascular training equipment at the gym, browse the boutiques in the shopping center or fill the hours with golf, kayaking, sailing and more. By night, sip refreshing cocktails at the sport’s bar, watch nightly live shows and feast on gastronomic cuisine; from minimalist Japanese delicacies to fiery Mexican cooking. More information and to book: Barcelo Bavaro Palace Deluxe. What: Located on St. Vincent’s southwest coast, this all-inclusive five-star luxury hotel is the island’s most glamourous; set on a stunning white beach against a backdrop of mountain peaks and tropical forest with cascading waterfalls. Accommodation is arranged in one, two and four-bedroom villas, most of which have a plunge pool. Paradise for sports fans, the hotel has three swimming pools, a state-of-the-art fitness center, a Pat Cash Tennis Academy, a Liverpool FC Soccer School and a Cricket Academy. Best for kids: The Little Harlequins Kids Club provides daycare for young children with supervised, fun-filled activities including beach parties, glass bottom boat rides, dolphin-spotting by power boat and sea-shell treasure hunts (charges apply for some activities). Club 61 is a teen zone where kids aged 13 and over can hang out in a lounge decked out with a pool table, darts board and Playstation. Best for parents: Learn musical theater performance skills with industry experts at the Harlequin Performing Arts Academy, dine at six different restaurants and rejuvenate with a heavenly outdoor massage or holistic ESPA treatment at either the Thai pavilion or under a gazebo on the beach. The resort is also home to Indigo Dive, the island’s only PADI 5 Star diving center which provides guests with tailor-made diving experiences to suit their abilities and also offers glass bottom boat tours and deep sea fishing. More information and to book: Buccament Bay Resort. Best for parents: There is plenty to please grown-ups who want time out from the kids; take a dip in the adults-only pool, rent a car to explore the island's rum distilleries, book a couple’s spa treatment and savour a private beachside dinner. Highlights include complimentary classes in cooking, cake decorating and drink mixology as well as watersports such as sailing, snorkeling, boogie boarding, kayaking and windsurfing. The romantically-inclined can even renew their vows here. More information and to book: Turtle Bay by Elegant Hotels. Best for kids: The CocoLand® waterpark boasts exhilarating rides, slides, cannons, whirlpools, waterfalls and a lazy river to thrill kids of all ages. Coco Kidz provides a jam-packed activity schedule for children under 12 whilst The Clubhouse is a dedicated activity center for tweens and teens aged 13 to 17. Most impressive is The Zone, the first paintball facility of its kind in the Caribbean where teams of up to five players can fire neon paintballs at their opponents (extra charges apply). Best for parents: The on-site Aqua School offers complimentary watersports including waterskiing, banana boating, snorkeling, sailing, boogie boarding, kayaking, windsurfing and paddle boarding. Snorkel with turtles, book a round at the 18-hole Robert Trent Jones-design golf course at the nearby Royal Westmoreland, pamper yourself at the spa and stay in shape with Cybex cardio and weight equipment at the fitness center. For those who fancy exploring the island, there is a series of excursions including duty-free shopping trips, catamaran cruises, rugged safari tours and glass-bottomed boat rides. More information and to book: Tamarind by Elegant Hotels. Best for parents: Kayak, snorkel, windsurf or swim in the tranquil waters of the resort's two reef-sheltered beaches - or simply laze on the gleaming sands. Other facilities include a state-of-the-art fitness center, mini cinema and Spa Tranquility, a soothing sanctuary specialising in eco-conscious treatments. Get into the island spirit at four bars and dine at three restaurants – the most salubrious of which is Nicole’s, a showcase of modern French and Italian gourmet cuisine. More information and to book: The Verandah Resort & Spa.